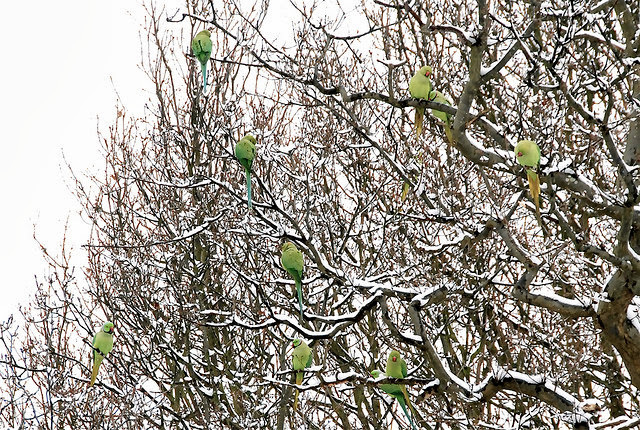 For a while the number of Parakeets in London remained small and toleration was the name of the game. After all, London has a long and proud history of welcoming foreigners to its heart and making them its own. 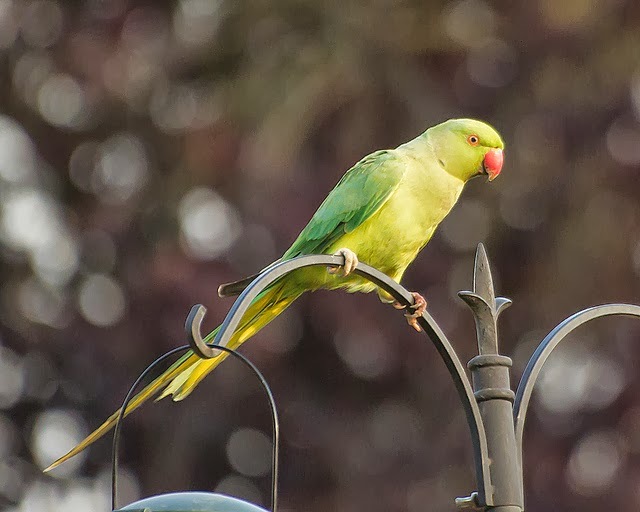 So it was with the parakeet. However, their numbers exploded in the late nineties and many now seem them as a pest. 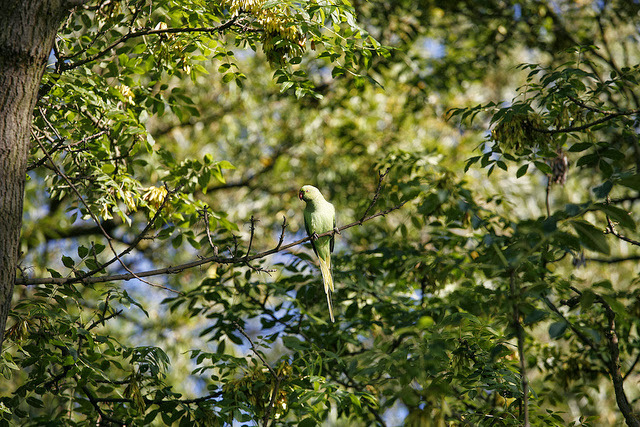 From the beginning of 2010 open season on the cockney parakeet was declared. Now that they have spread outwards in to farm land it seems that these Himalayan guests have gone from being a colorful surprise in the garden to a serious raider of crops. 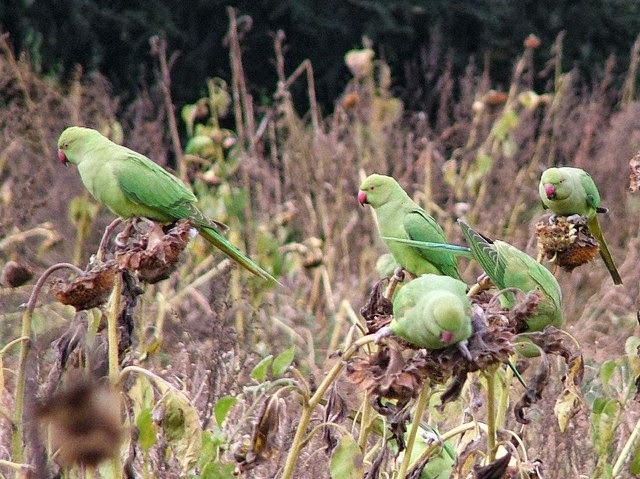 One wine producer in the south of England lost enough grapes to make three thousand bottles of wine to the parakeets in 2010. The fear is that in future years their numbers will jump to an all time high and will seriously affect the fruit farmers of Southern England. 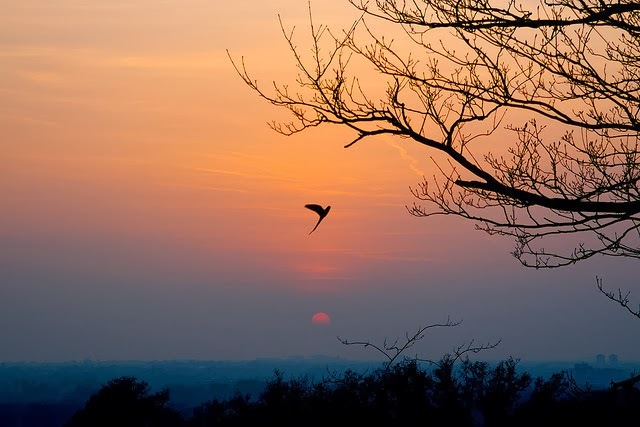 Natural England announced that from the beginning of the 2010 they would relax the rules which protect the wild birds meaning that pretty much anyone with a gun will be able to shoot them. However, many naturalists pronounced this decision to be ‘racist’ – and attempt by the authorities to wipe out a benign if invasive species before it covers the whole of the UK. 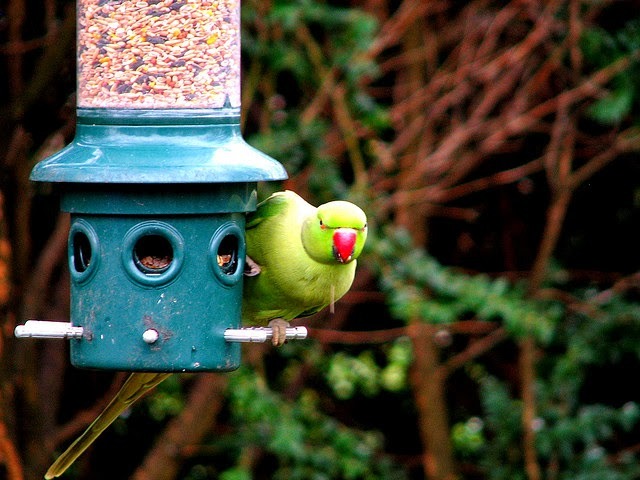 It has already become the fifteenth most populous bird in London. 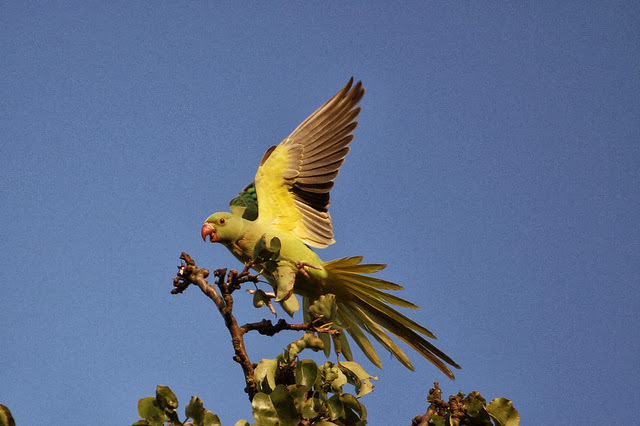 The parakeets are also being accused of bullying smaller native species of birds and effectively cutting them out of the property race for nesting sites, taking the prime sites for themselves and leaving the native birds somewhat out in the cold. 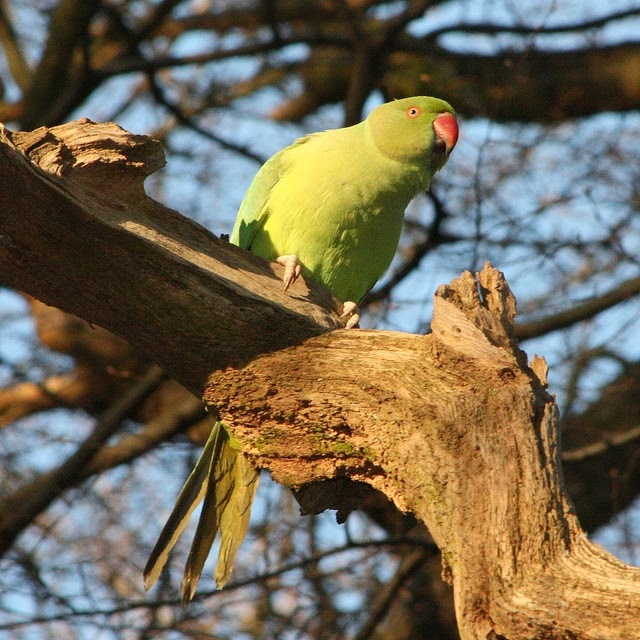 However, many naturalists, including the much respected London Wildlife Trust maintain that the evidence is scant to show that the indigenous species are losing out to the parakeets. 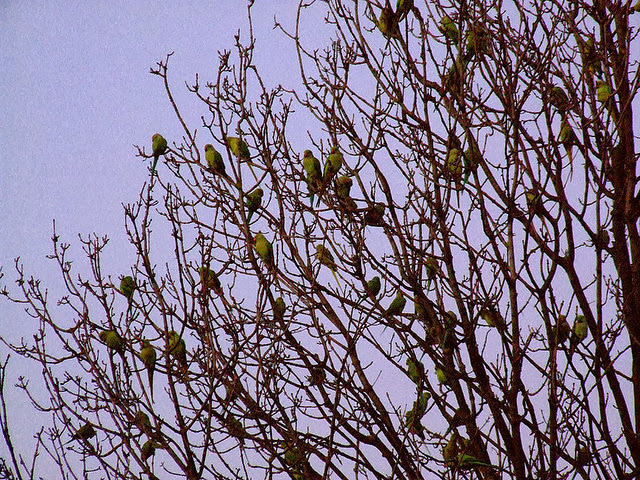 Many people point out that the worst thing about the birds is their incredibly ear piercing shriek, mostly heard as they dive over the London skyline like a host of latter-day spitfires, in formation to repel some imaginary foe. 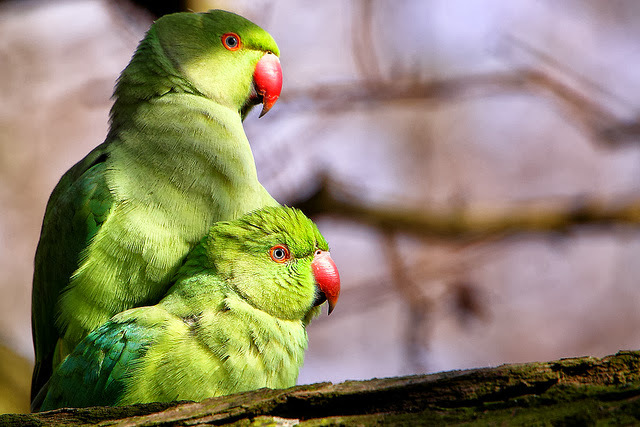 Others suggest that it is the cockiness of the birds that irritates the most. They can often turn and face people with something of a look of avian disdain which can be somewhat disconcerting. They are generally seen by most householders as exotic but harmless and have become a great favorite with armchair twitchers. 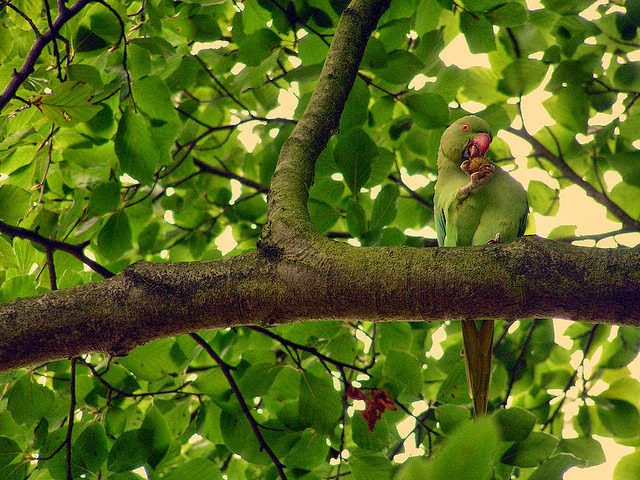 The parakeets, it is maintained, are as British as curry and truly represent the capital’s diversity in bird form. 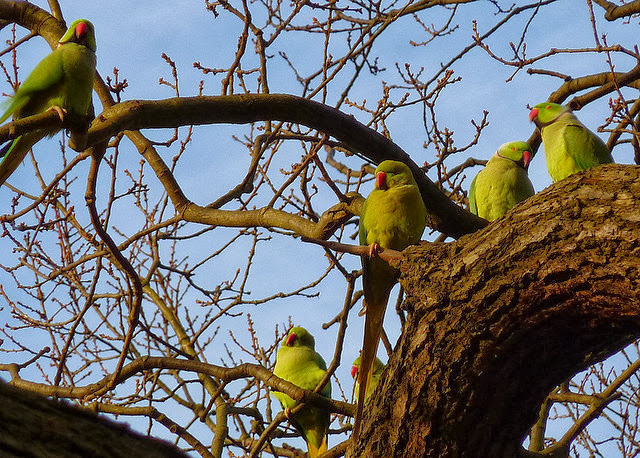 One of the major arguments that those in favor of a cull use is that the ring-necked and monk parakeets (to give them their full name) breed early in the year – often starting their season in January. 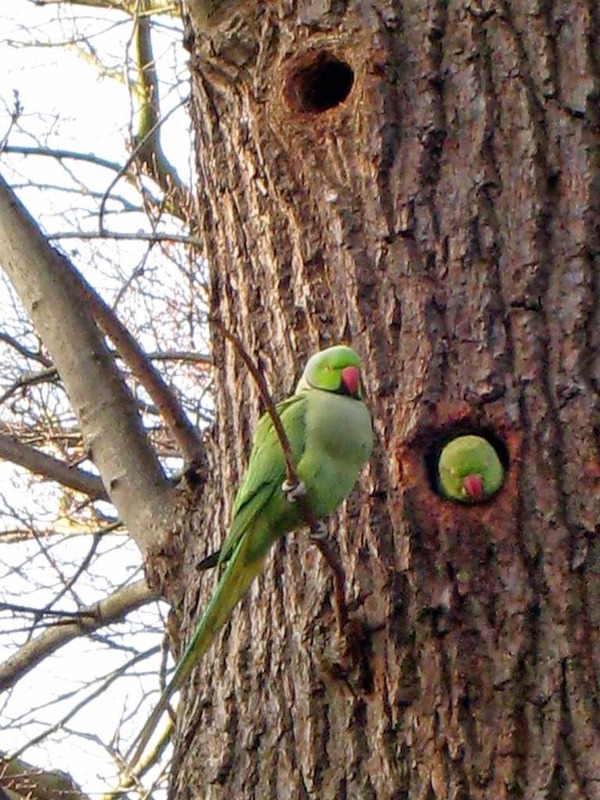 They then take all of the best nesting places away from the larger British birds that, without the presence of the parakeets, would ordinarily use them in March and April. 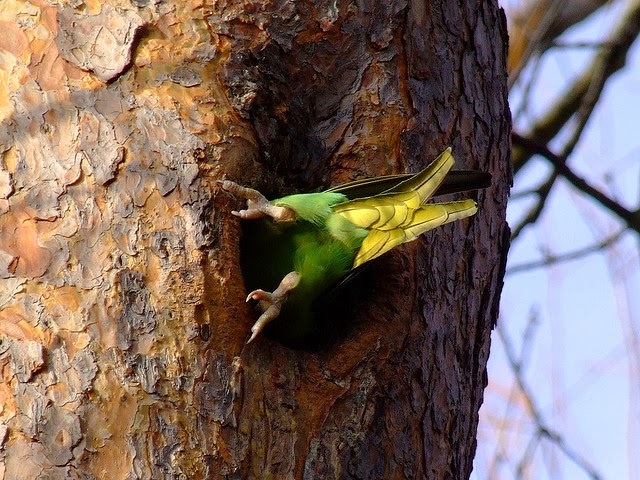 The parakeets are, it must be said, keen to find the ‘des res’ of their choice and spend days looking for the ideal nesting place. The naysayers, however, look as if they will get their way. 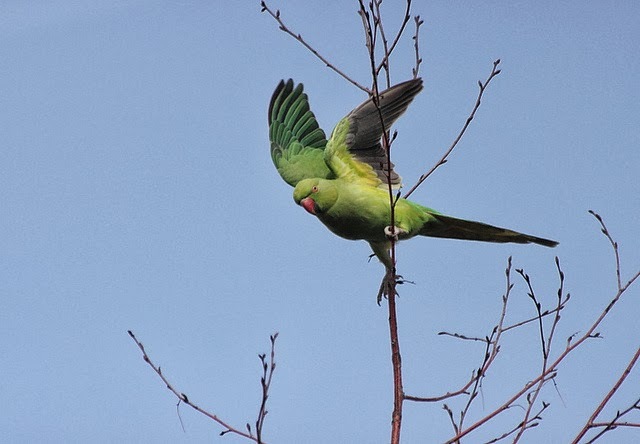 It is feared, though, that the rarer green woodpecker which shares the hue and size of the parakeets will be accidentally targeted by those keen to prove their prowess with a pistol. 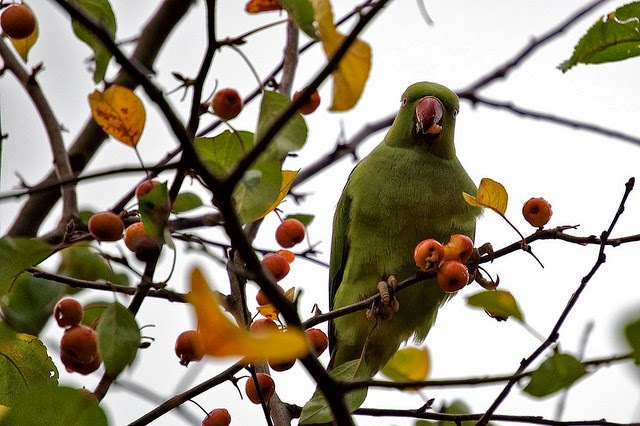 Additionally, there are already laws in place which would allow the shooting of parakeets in orchards and such and the worry is that those who have no need to shoot the birds will join in the ‘fun’ for the sheer hell of it. 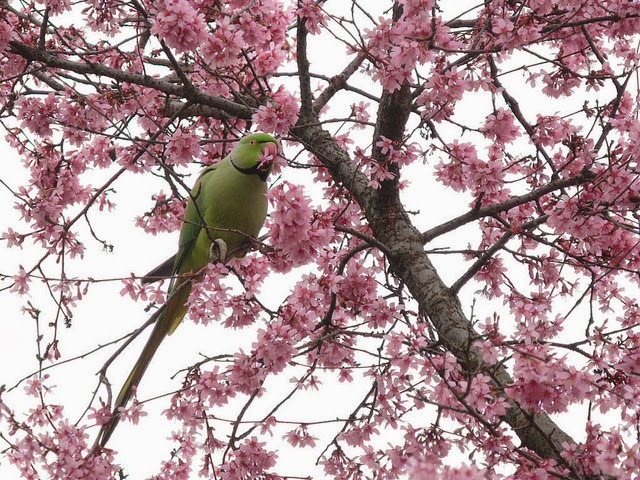 As the number of parakeets raise from their present high of forty thousand the clamor for population reduction will only increase. The introduction of the grey squirrel from North America is cited as a reason for the cull. A century after their introduction the native red squirrel is virtually extinct and hanging on by a thread. The grey on the other hand has become endemic. 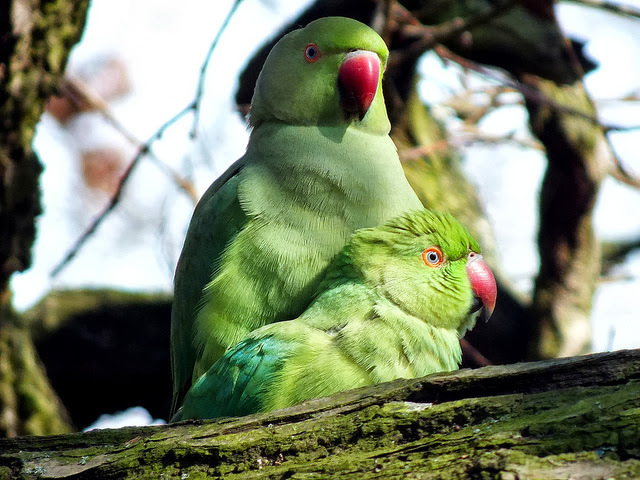 If the parakeets live long and prosper, spreading throughout the United Kingdom then a similar situation may well arise in the bird population, those in favor of the cull maintain. However, the announcement by Natural England worried many because they feared that people would conclude that it was open season on the bird. In fact they need a license to shoot them and only then if their livelihood is threatened. Householders irritated by the sustained squeaking and squawking created by the birds are not be able to use their air rifles willy nilly in a form of noise abatement. 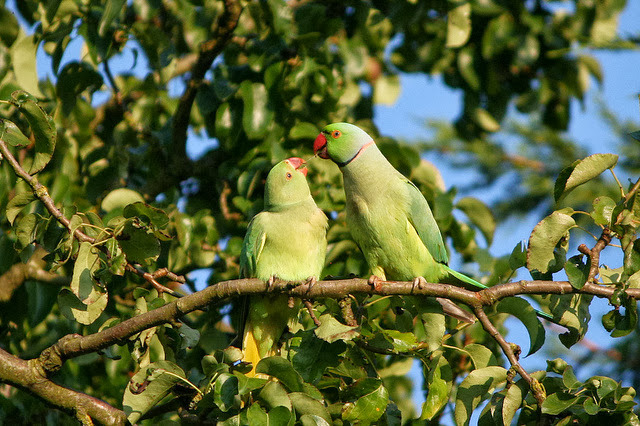 Conservationists who thought that this message may not get across and the parakeets would soon start falling from the skies have also been proven wrong, however. 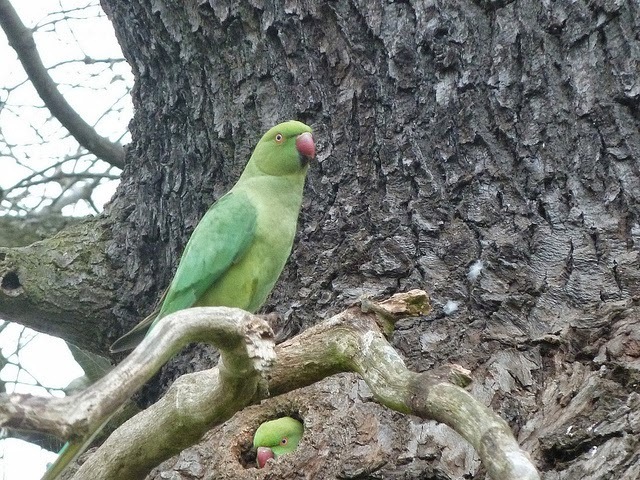 No one is quite sure how the parakeets landed in London but two legends endure. The first is that some escaped during the filming of the famous Bogart film The African Queen and slowly spread. Another has it that rock star Jimmi Hendrix released a pair on hazy morning as a symbol of world peace. 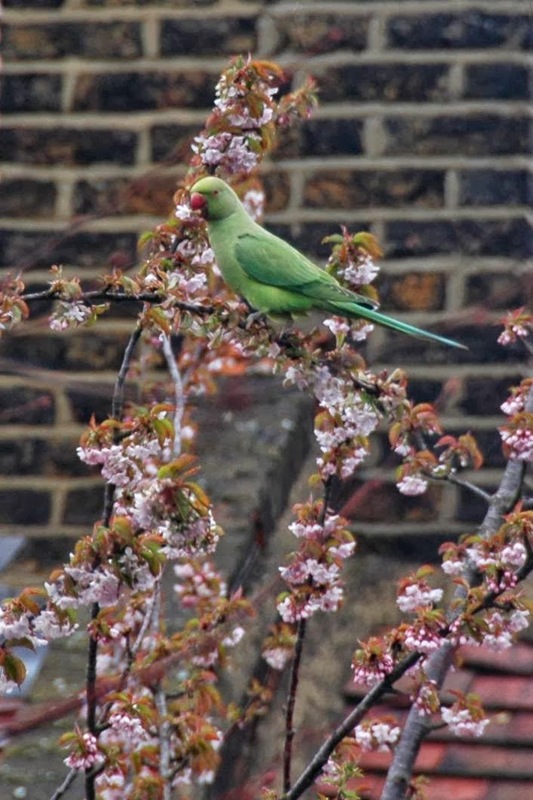 Whatever their origins in London, it is admitted by most that they have perhaps become rather too widespread for the urban ecosystem to sustain their numbers. Quite what to do about it, though, is leaving the ‘house’ very much divided.